John Adams was born on October 30, 1735, in Massachusetts. He was a delegate to the Continental Congress, a diplomat in Europe and would go on to become the first vice president, and second president, of the United States of America. 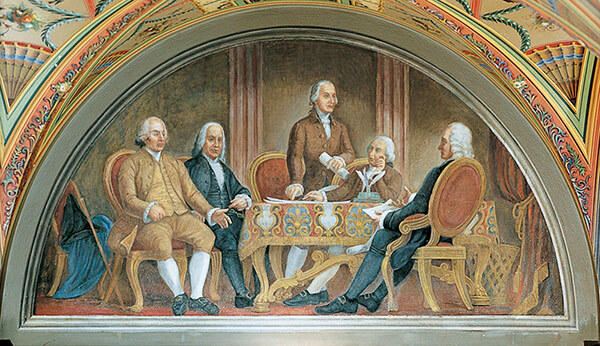 Similar to many other Founding Fathers, Adams appears in several pieces of art throughout the U.S. Capitol. He played a large role in the Declaration of Independence, and art involving this document is where he can be seen the most. Scene from The Great Experiment Hall of Cox Corridors. 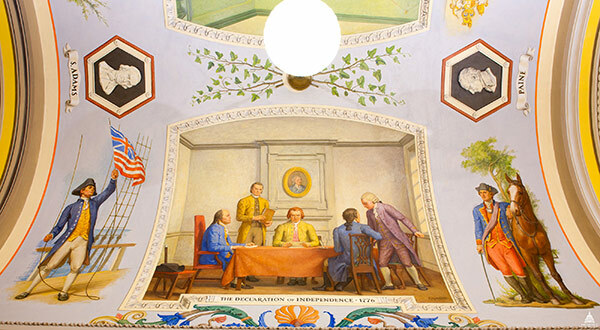 There are three instances of the signing of the Declaration in the U.S. Capitol that include Adams: a painting in the Rotunda, the Frieze of American History (cover photo) and a mural in the Cox Corridors (seen above, standing right). Lunette over room S-118 in the Brumidi Corridors. This isn't the only event-based art in which Adams is spotted. At one end of the Brumidi Corridors, Adams appears in "The Signing of the First Treaty of Peace with Great Britain." Joining him in this 1782 setting are Benjamin Franklin, John Jay, Henry Laurens and Richard Oswald. An upper panel of the Senate Bronze Doors. 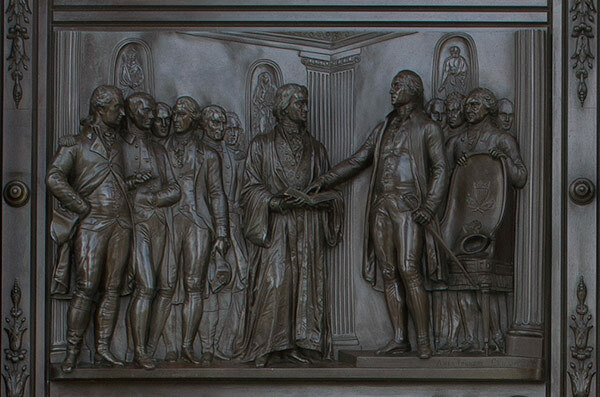 In the Senate wing's bronze doors, Vice President John Adams is shown on the right of the panel depicting the 1789 "Inauguration of George Washington as First President" scene. This event featuring Adams can also be found painted in the Cox Corridors of the U.S. Capitol. 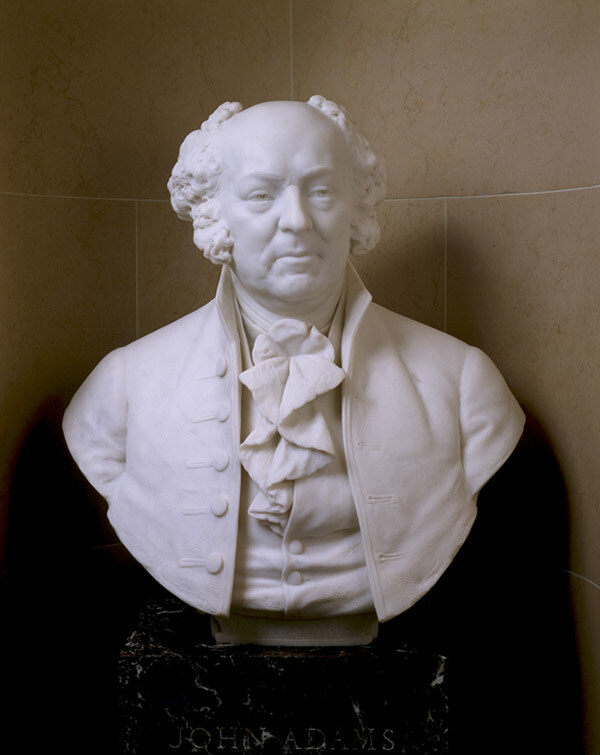 Bust of John Adams in a Senate Gallery niche. Photo via Senate.gov. While these pieces of art show Adams in action among other historic figures, there are also two instances on the U.S. Capitol campus that highlight him on his own. First, a bust of Adams sits almost directly above the rostrum of the Senate Chamber as part of the Senate's Vice Presidential Bust Collection. Second, a building on Capitol Hill bears his name. 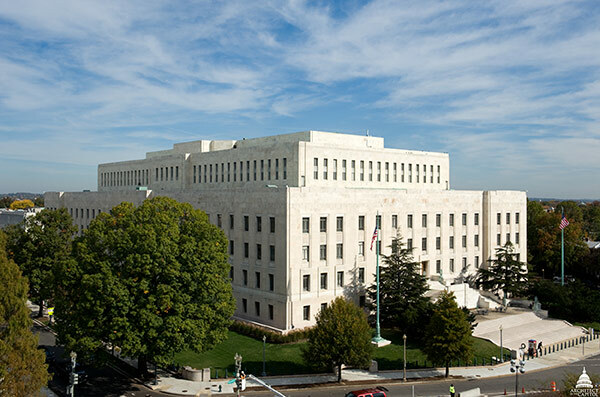 View of the John Adams Building in Washington, D.C. In 1980, after being known for years as "The Annex," the Library of Congress' second building was named to honor Adams. A fitting tribute for the person who approved the law establishing the Library of Congress in 1800.